Today marks a year since I started this blog. 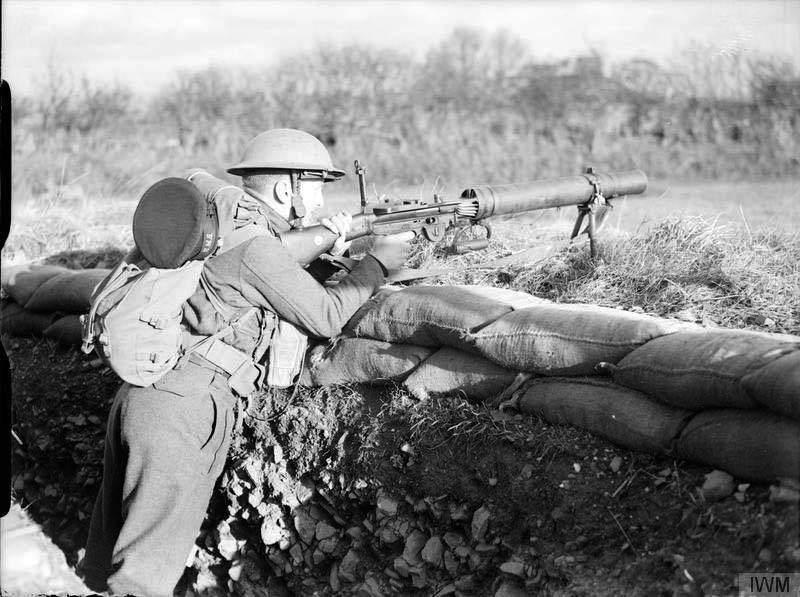 In that time I feel I have covered a large selection of British and Empire militaria and I hope you have enjoyed reading it as much as I have enjoyed researching and writing these posts. A quick calculation suggests that the blog now stands at around 94,000 words in total and we have had nearly 15,000 hits since the first post. I have no plans to stop writing anytime soon, so hopefully you will continue reading this, I will continue buying and writing about militaria…and no doubt my wife will continue complaining about all the old ‘junk’ I’ve bought! 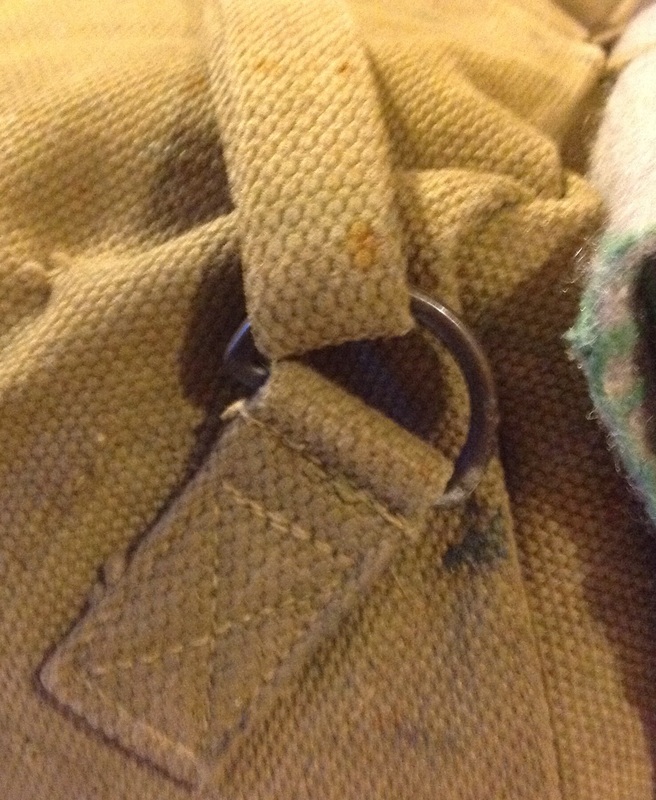 Rucksack– This is a large rectangular bag, having sides with weather flaps. 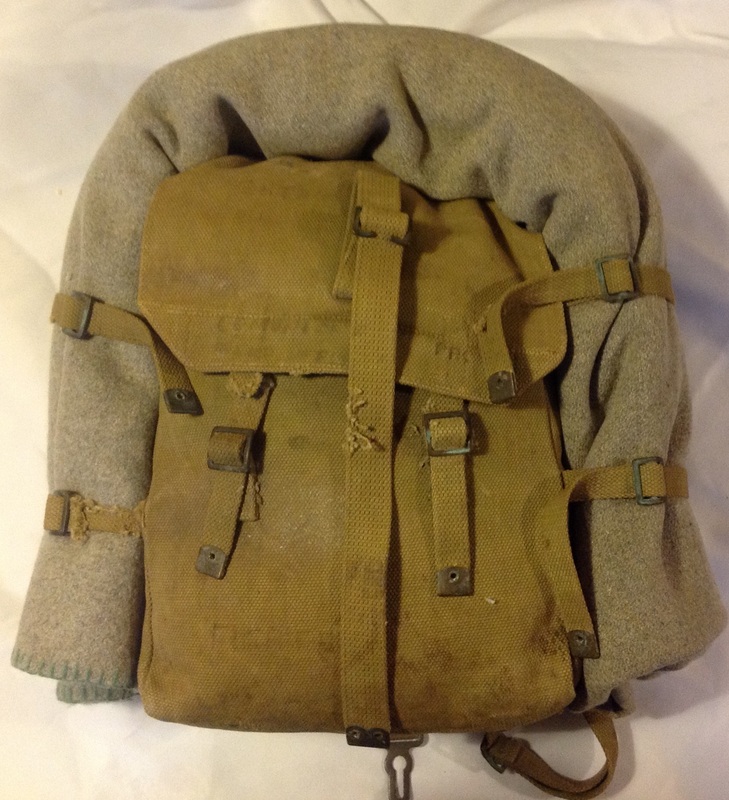 Five narrow straps are provided around the rucksack, two on each side: and one on the top, to enable the blanket and waterproof sheet to be carried in the form of a roll outside the rucksack: all the small items of the kit being carried in the bag. 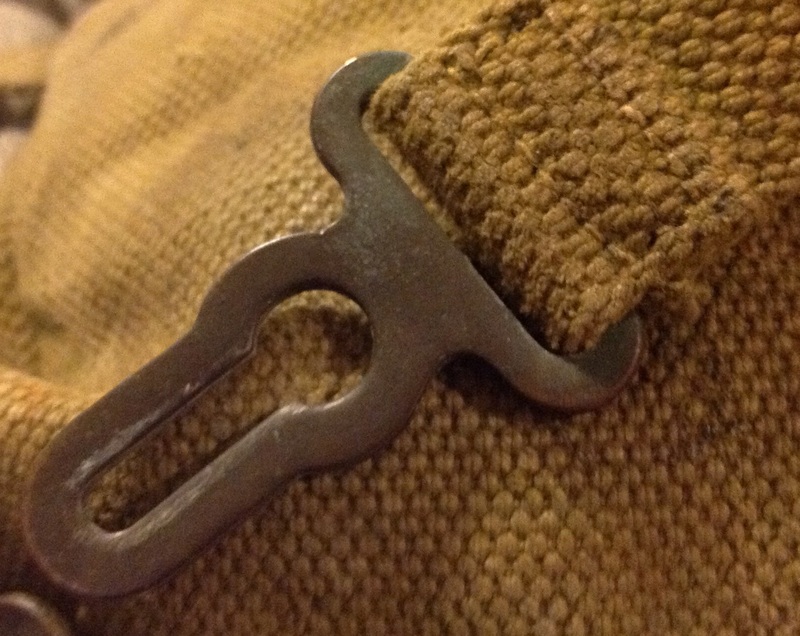 A 1- inch strap is attached to the outside of the lid for securing mess-tin in cover: but this article may be carried inside the rucksack if there is sufficient room. 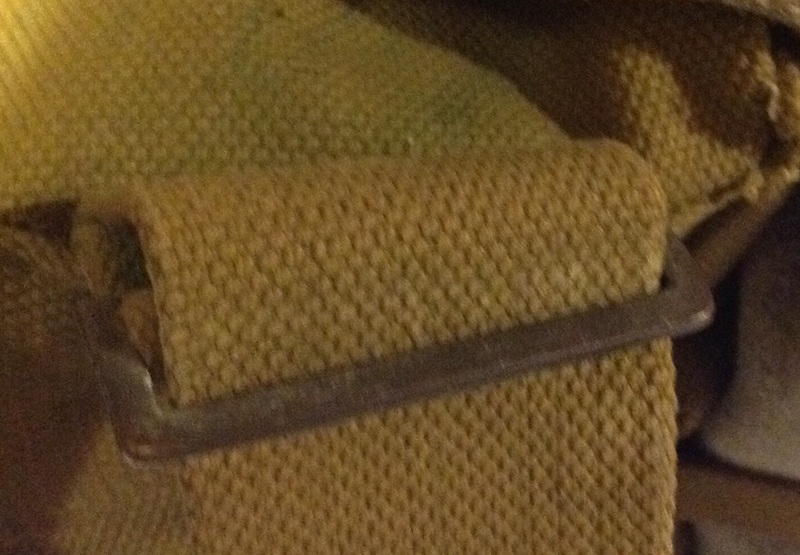 The rucksack is carried and attached to the rest of the equipment by means of shoulder-straps: broadened similar to the braces, adjustable through buckles at the top: and having hooks on the narrow ends to engage the “D’s” of the buckles on top of the brace attachments or cartridge carriers: Narrow “diagonal straps”, adjustable through buckles, run from those hooks to the bottom of the rucksack, the left diagonal being permanently fixed by a metal “D”: and the right being connected by means of a smaller metal “D” to a hook, which latter fitting is attached to the bottom of the bag: On the back of the rucksack near the bottom is a short strap having a key-hole fitting: which engages a stud placed in the centre of the bottom of the bag: This strap is passed around the belt, to prevent movement of the rucksack when running. 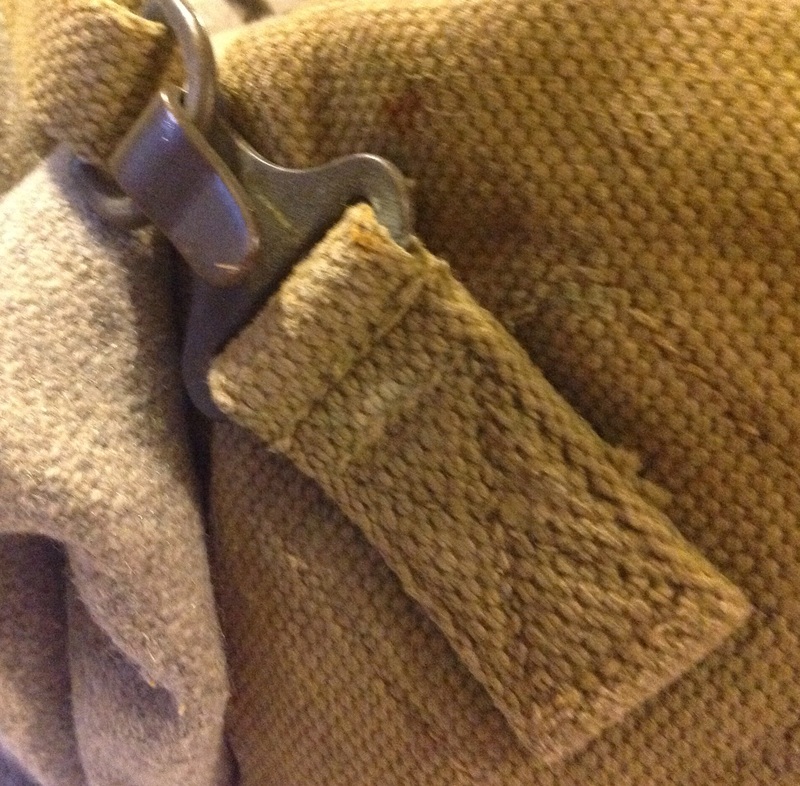 As can be seen my example has been in the wars, one of the two straps holding down the top flap is broken and the top blanket retaining strap is missing. 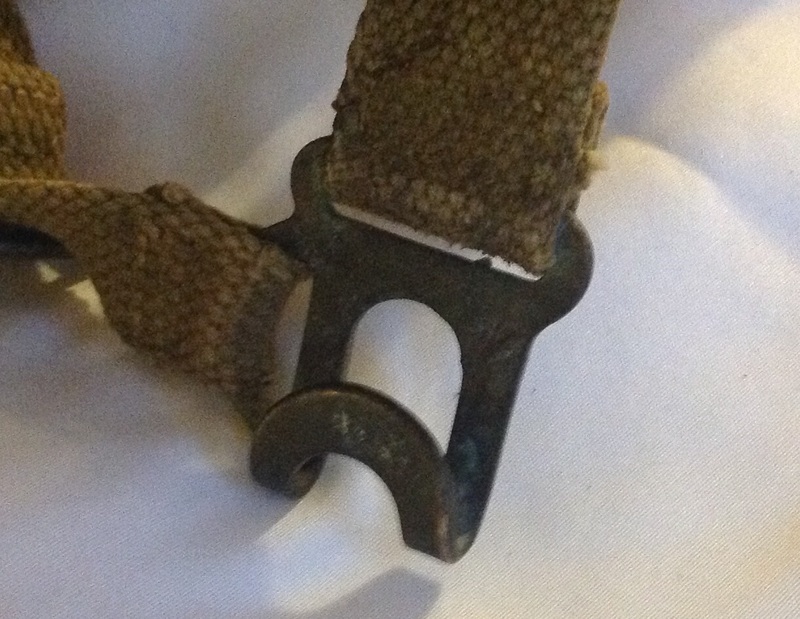 I plan to restore these two as soon as I can find some webbing of the correct width. 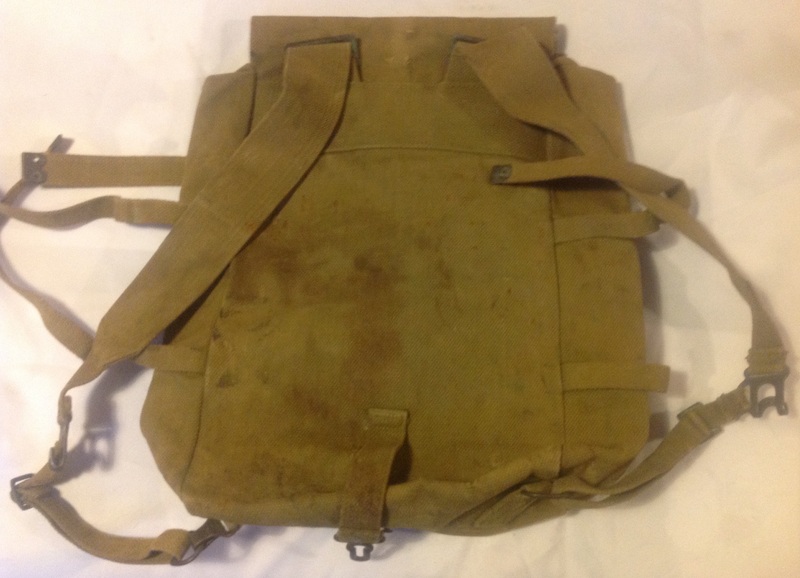 The rucksack is dated 1921 and was made by MECo: Note also the /|\ over an ‘N’ mark for the Royal Navy. 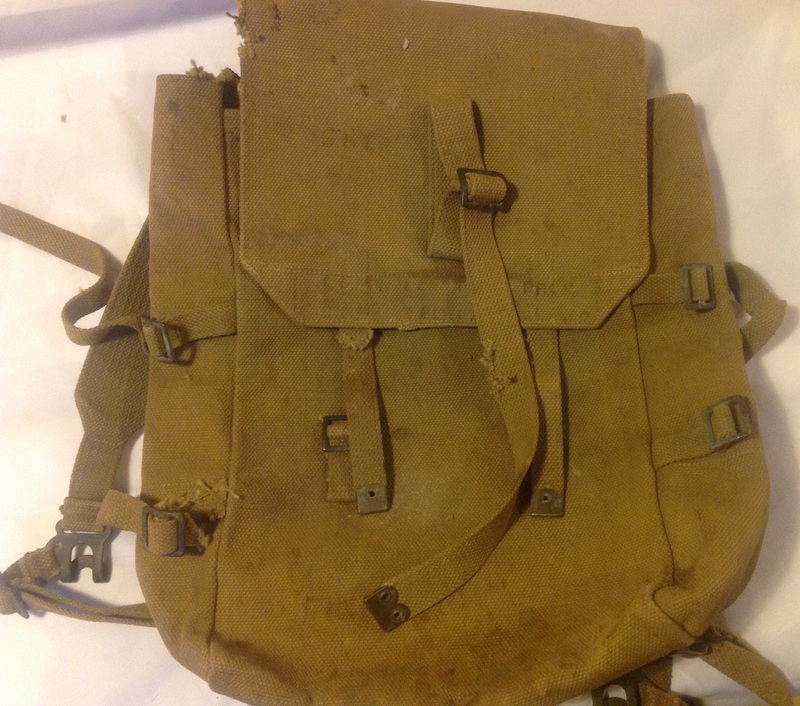 The ‘Royal Navy Field Service Book 1932’ helpfully includes a kit list for the contents of the rucksack (pack): My thanks to Tony Boyle for providing me with this information. 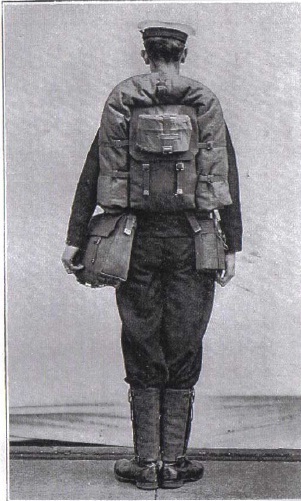 The picture below is interesting as it shows a member of the Royal Navy Coast Watch from about 1940. 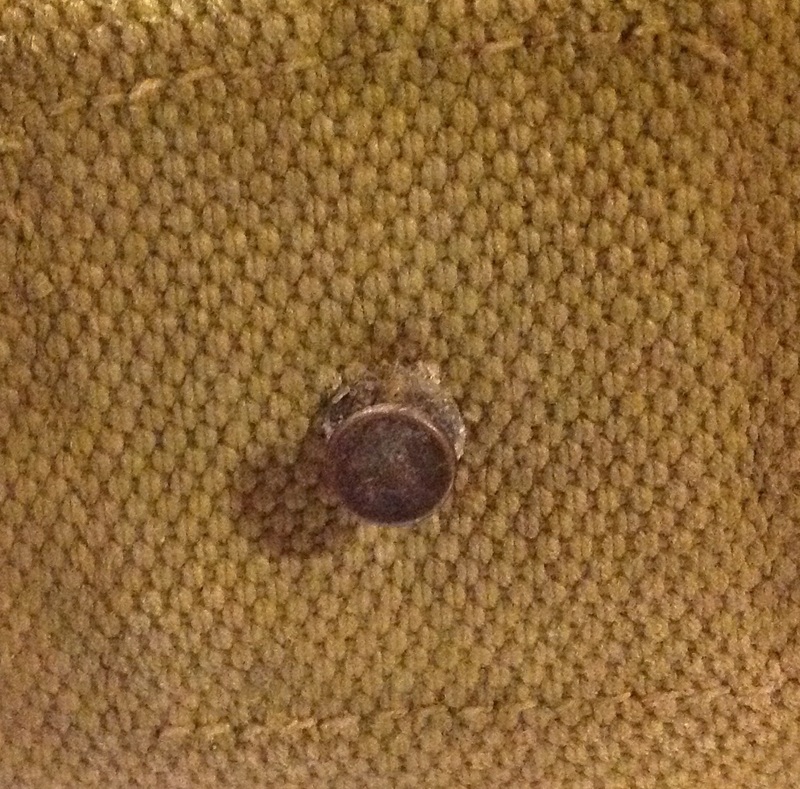 Note the 1919 pattern haversack, worn without a blanket roll. 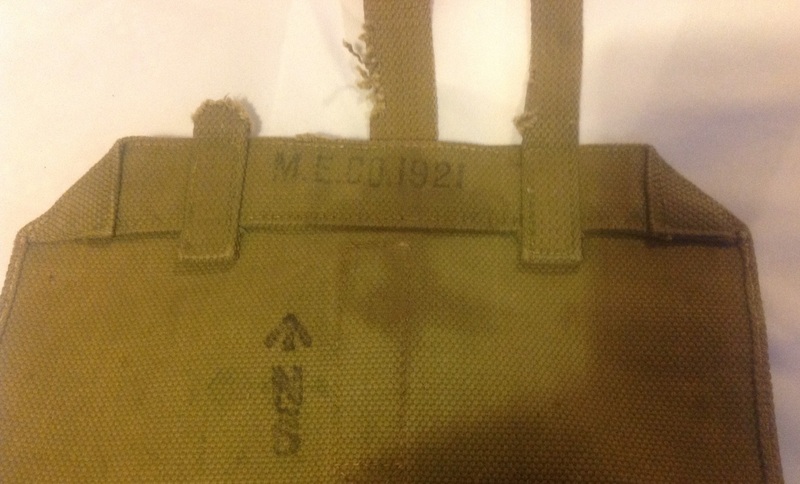 The straps are clearly visible: I now have four items of 1919 pattern webbing and I have made a good start on collecting this rare and hard to find set of equipment. As ever luck and spotting the diamond in the rough have played a big part in this. Like the 1901 water-bottle from the other night, I have had to accept items in less than perfect condition. However in both cases repairs should be fairly easy and inexpensive and it has allowed me to add a couple of very rare items to my collection. 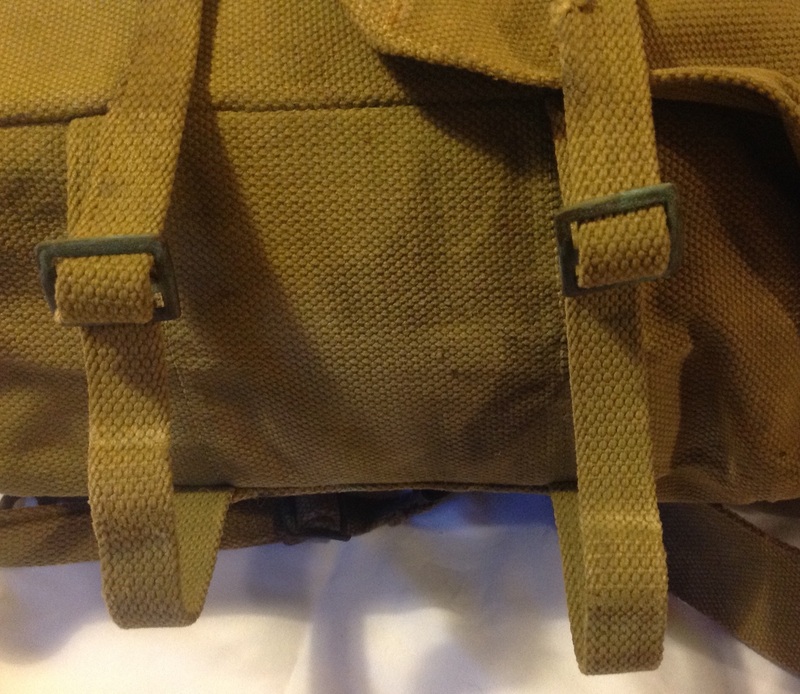 This entry was posted in 19-Webbing, equipment, Inter-War, Latest Pick Ups, Royal Navy, Webbing on May 19, 2015 by hatchfive.